I bet it has been a tough year for you. In addition to losing a sibling you've probably thought a lot about your own mortality. A retreat sounds like it would be very good for you right now. EG CameraGirl: Exactly. It's been a tough year. Luckily, I have a really wonderful support network of friends and family. And a retreat is a beautiful place was exactly what I needed. Your description made me want to be there. It sounds as if your return was bitter-sweet, triggering memories, but so very necessary. A beautiful and serene place, which could only help. I envy you your experience. And the photograph is perfect. Possibly the reason for my envy. 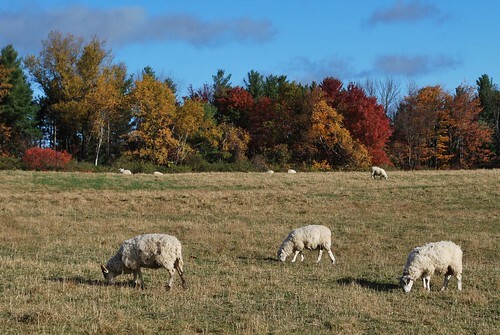 Lovely photos of the fall colors and sheep. I love the sheep pictures, as always. Thank you. It sounds like the perfect spot for a retreat. Quiet, peaceful, uncomplicated and very thoughtful and spiritual. I didn't know you are coming up on the anniversary of your sister's death. That's a very tough anniversary -- one thinks there is closure, only I'm not sure there is such a thing. But it does mean you have been through every "annual" family occasion -- birthdays and holidays -- and you came through it. You did it once; you'll do it again and again and it will get a little easier each time. I hope the retreat brings you the time for contemplation, for solace, for reflection and all that you need. Jeanie: I guess we *have* been through every holiday, but it really doesn't feel like it. I think that's because last year, the holidays came so soon after the funeral. The idea that it's been almost a whole year feels unreal to me. Joe. If this was for Columbus Day weekend than I want to share that Bruno double booked us! We were going to go. But it all worked out as it is suppose to since instead we were able to run to New York and be 20 ft from Papa Francesco in Central Park. I am hoping it is that weekend because Lisa usually chooses the closet (as it is "her" room as well) and knowing that you all were there will really seal the joy! Also, what I was thinking making reservations when my oldest would be home from college, I have no idea! Anyway, I felt the need to interject just now. I feel quite connected to it when you share it on the blog. Annette: We were there last weekend -- so not Columbus Day. But I did think of you and wonder if we'd run into you. Whenever I light candles in the crypt, I say a prayer for all the women I've met at the monastery over the years. Thank you! That made my day! We are considering a winter visit. Have yet to do that.